The MX4660 is our preferred stepper motor driver solution for DIY NEMA 23 CNC electronics. With a working voltage of 20-60VDC and output current up to 6.0A, the MX4660 is a complete solution for driving 4 powerful two-phase stepper motors with high reliability. It offers high precision, excellent torque, extra low noise, very low motor heating, and smooth motor movement. Based on the latest DSP technology and Leadshine’s advanced stepper control algorithms, the MX4660 offers features such as anti-resonance, programmable multi-stepping, input pulse smoothing, and automatic idle current reduction. 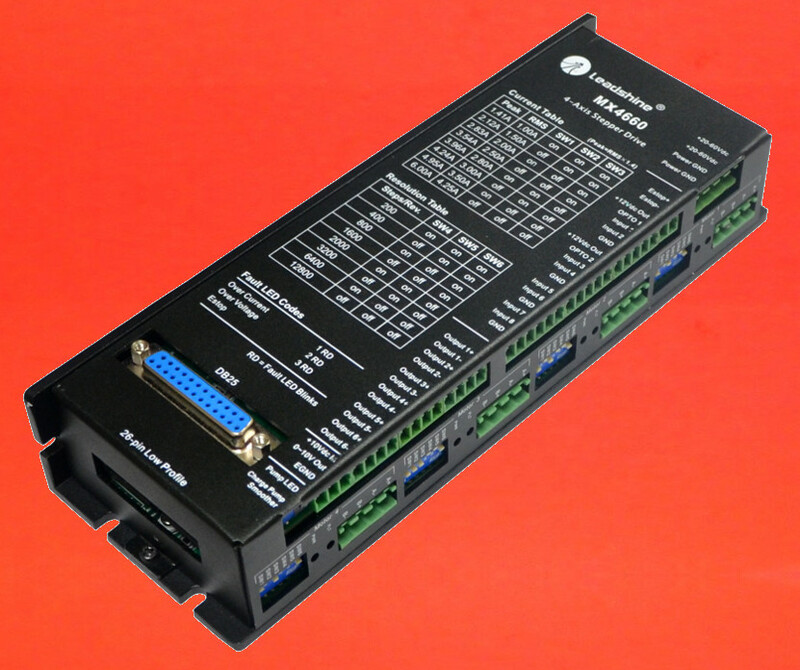 The MX4660 comes with a 26 pin header that breaks out additional IO for systems utilizing an Ethernet Smoothstepper, as well as a DB-25 connector for pin to pin compatibility with the older Gecko G540, allowing for a drop-in upgrade to superior digital technology for existing electronics systems. Add our 5A Bulkhead Enclosure Connectors for pluggable connections with our motors and motor cables. This product was added to our catalog on January 28, 2015.